Country: Australia | Beer Apprentice - Craft Beer News, Reviews, Interviews and Info. 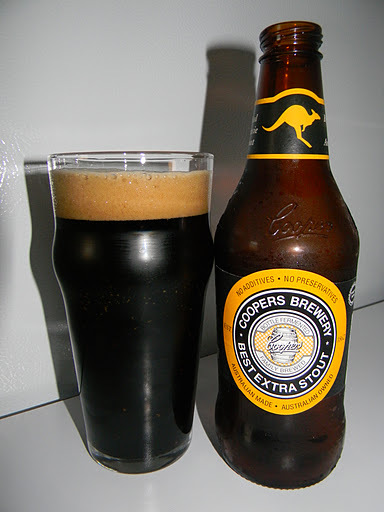 For today’s craft beer review I’m going to be sipping on a Coopers Best Extra Stout produced by Coopers Brewery Limited located in Leabrook, Australia. After all of the hustle and bustle from yesterday’s Christmas gatherings I was really in the mood for a Stout today. I have tried this brew once before, but it was so long ago that I can’t really remember what I thought of it. I think I liked it. Well, I figure I better give it another go. Here’s the commercial description from the website, coopers.com.au. When to Drink: On cold, wintry days in front of a roaring fire with hearty food and hardy mates. Who Should Drink: Not a beer for the fainthearted, but there are more ways than one to enjoy a grand stout. Sounds good enough. Let’s drink. This beer comes in a 12.7 oz. bottle and it has an ABV of 6.3%. The brew poured a very dark brown to black color with just a smidgen of ruby showing through at the bottom of the glass. I could see quite a bit of sediment sticking to the sides and bottom of the nonic. The crown was khaki in color, very well sized, smooth, creamy and soft. The retention time was just average and the lacing left a little to be desired. The aroma presented notes of dark chocolate and day old coffee grounds. Additional hints of dark breads and roasted dark grains. A slight creamed milk tone was noticed too along with a troublesome burnt rubber type of fragrance. Underlining it all was a detection of dark raisins and plums. Hmm. Not the best bouquet I’ve ever smelled, although not completely horrible either. The taste was a little more straight forward than was the smell. Roasted malts, dark chocolate, coffee and espresso. A slight touch of earth and graininess. Better balanced and more enjoyable, however just a touch timid. Also, maybe even the most remote flavor of alcohol at the very back end I thought. The mouthfeel was medium to mostly thin. Very smooth and light, but considerably watery. Not much was left on the palate after the swallow either. Only the most remote amount of warmth was felt at the back of the throat. I was a little disappointed with the mouthfeel. I was expecting much more. Well. This is an “ok” beer I guess. I seem to remember it being quite a bit better the last time I tried it, but no matter. I still finished it with ease. I think this would be best suited as an introductory Stout. It’s not going to overwhelm the taste buds or knock anyone’s socks off, but it still has a few of the proper characteristics of a good Stout. If you’ve never had it and you see it sitting on the shelf, pick it up and give it a go, but don’t drive out of your way to find it. I think there are many others of this style that would better satisfy your needs.